Wow…Almost 10 Years in Business! Prepare to Celebrate in January 2017! Comments Off on Wow…Almost 10 Years in Business! Prepare to Celebrate in January 2017! 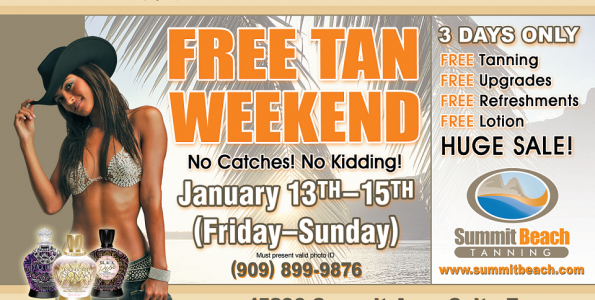 Free Tan Weekend…January 15 – 17, 2016! BRING YOUR FRIENDS. It is our 9th ANNIVERSARY and you are invited for this free weekend of tanning and huge sale (Friday – Sunday). Free lotions. NO CATCHES, NO KIDDING! Let’s look great for the new year! Come join us! Comments Off on 9th Anniversary Celebration!!! Summit Beach Tanning is Top 250 in the U.S! Comments Off on Summit Beach Tanning is Top 250 in the U.S!